You are here: Home / Recipes / Cinco de Mayo lightened up! Cinco de Mayo lightened up! Somehow my move to Boston after college would be my first introduction to the 5th of May festivities, which at the time meant decorating the hospital cafeteria, playing Mexican music and serving what was considered Mexican fare — burritos, tacos, nachos with cheese, etc. After work was time for real margaritas — you get the idea. As I get older and lose the desire to drink tequila on a “school night” since I still have to function as a mom the next day, I would rather honor the day that is celebrated more in the US than in Mexico as it were, in a more subtle way and with some healthier food than what one typically eats that day. Black coffee isn’t necessarily a part of a Cinco de Mayo menu, but I definitely think black beans should be! 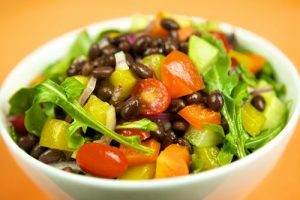 If you weren’t planning on including them, I’m hoping my twist on a black bean salad entices you to. This “Loaded Black Bean Salad” — which you may recognize as the cover shot for Lighten Up! — is my favorite way of eating black beans when they’re not in a soup! I make this salad over arugula for nutritional value but primarily for the great, strong flavor of arugula sort of as a replacement for cilantro. I love this “soapy” herb, but it has a polarizing effect on people’s taste buds, so I just try to avoid it since I don’t want to turn off cilantro haters from even trying my recipe if they see that ingredient! In any case, here it is — a healthy way to get loaded on Cinco de Mayo!